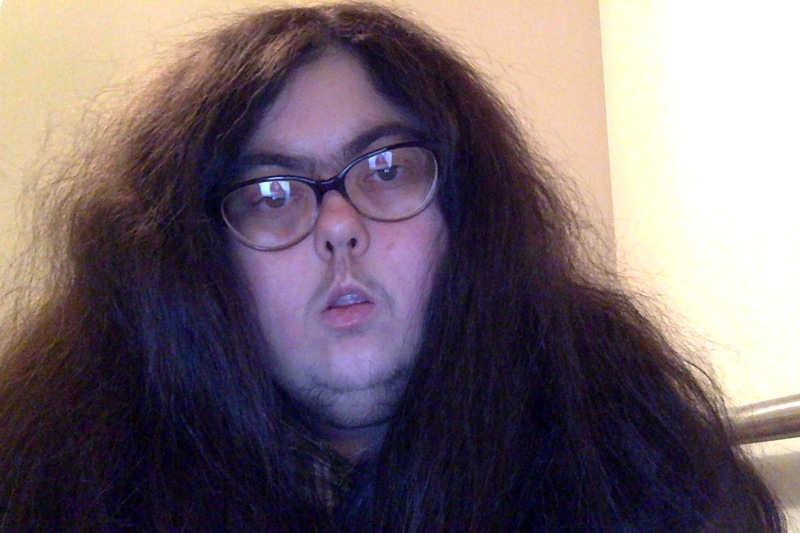 A picture of myself: Light skin, glasses, long extremely thick dark hair, large eyes, unibrow, small double chin, scraggly hair on chin and upper lip, small nose that turns up, small mouth. that’s usually slightly open. My name is Mel Baggs, and this is my blog for poetry and related types of creative writing. I really don’t have a lot to say right now, as I’m still in the process of collecting and posting poems here, from other places I have posted or stored my poetry. This is mostly going to be a poetry blog, but there will be some prose and prose poems if they seem sufficiently poetic. When I’m not writing poetry, I like to crochet and paint. As in my poetry, my paintings try to convey an experience of the world that most people don’t have. Some people call it ‘sensing’, it’s a world before conscious thought takes over your mind. Some people can’t remember it, some can, and a rare few of us never totally outgrow it even if we also learn more conscious idea-based thought. I’m one of that last group of people. I often try to convey sensing in poetry or painting because it doesn’t lend itself to ordinary writing. It’s easier to use metaphors than it is to try to describe it in a dry, scientific way. Sensing involves seeing the world through a sensory and pre-sensory lens, picking up on patterns (the sensory kind, not the logical or mathematical kind) between those sensory and pre-sensory experiences, and reacting to things that other people can’t perceive because they’re too busy perceiving what their ideas about the world tell them to perceive. Sensing is a common mode of thought in people with autism and other cognitive disabilities, especially severe cognitive impairments of various kinds. People who rely on sensing for an extended period of time develop entire ways of understanding the world through sensing. I talk about what I do, but I think the most important things in life are what we are. Every single person in the world is valuable, and that value can’t be measured. It can’t be measured by our contribution to the economy or the workforce. It can’t be measured by how much care we need to get through the day. It can’t be measured by how expensive it is to keep us alive. It can only be ‘measured’ by the amount that love is willing to touch us, and that makes us all equal in value, whether we accept or reject that love. And love is the most important thing in the world. I am grieving the upcoming loss of my father, and I have been told that grief is a form of love. Without love, we would not grieve. That is a huge source of comfort for me right now. Love isn’t just a passive thing that happens, though. It’s an active thing. So is compassion. Love and compassion are the two most important things in the world. Whenever I come near death, the only thing I regret is loving less, not showing enough compassion, things like that. So my bucket list looks less like a bunch of zany adventures and more like a list of was that I can be loving and compassionate to other people, be they friends, relatives, acquaintances, strangers, or lovers. I don’t always succeed by a long shot, and it can be difficult as an autistic person to show love when your social skills for showing things like that aren’t great, and you have a tendency to forget good friends exist for months or years at a time. But it’s something to strive for. I’m originally from the redwoods in San Mateo County, California, and have also lived in the redwoods in Santa Cruz County, California. I first lived in the redwoods during a time when my only way of understanding the world was sensing, and I didn’t have conscious thought to back it up. This resulted in a very intense bond to the place which has never been broken even though I now live 3000 miles away in what I consider to be a form of exile. I would love to live in the redwoods again, but there are many reasons that’s probably going to always be impossible. Anyway, my spirituality, such as it is, is centered around those specific portions of redwood forest, and as such I write about it a lot. This wasn’t a spiritual path I chose as much as one that chose me — it’s not related to any religion I’ve ever heard of. But I’ve now heard from people who live everywhere from redwood forests to deserts who’ve had similar experiences of becoming very spiritually tied to one place, without meaning to. So I imagine it must happen more than you hear about normally. Some of my writing about redwood forests has spiritual content, others are just metaphors, and a lot is a mix of both.